Haha! I caught him when he was yawning. Yes, I'm doing these projects out of order! I have to allow myself the sanity of doing that since I'm still trying to get together our outfits for upcoming events. April's Historical Sewing Monthly Challenge was "Gender Bender", so making something for the opposite gender, or something that was inspired by the opposite gender's clothing trends. I decided to make a waistcoat for my son to complete his outfit. 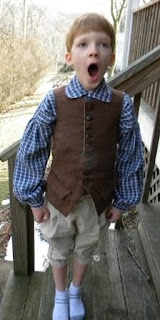 He already had the fall-front breeches, the shirt I made last month, and now he's fully dressed with the waistcoat! I couldn't have him running around in a state of undress (namely just a shirt and breeches), now could I? How historically accurate is it? 95% Still not sure about cotton thread in that time period, but it's what I have. I sewed most of it on the machine too. All the button holes are hand sewn though - all NINE of them. The horn buttons are so pretty! I've also had somewhat of an epiphany this month. I've been working to get involved with some WWII reenacting groups and have had wonderful success with a fabulous facebook group of ladies devoted to that hobby. They have been so helpful and welcoming, and I get so giddy and excited thinking about dressing up for the 1940s and teaching people about WWII. Other time periods pale in comparison really. I've been trying to be honest with myself and we only have so much money in our budget to devote to reenacting. So, I've been thinking that I won't devote any more money towards Rev War. It makes me sad, but I think it's realistic. I've even been wondering if I should go to the trouble of making my own outfit since it takes so much time. I do have all the materials, but time is the biggest issue. It's frustrating since I've already put money into it, especially my custom-drafted corset pattern. I guess time will tell. I'll have to continue thinking about it. But it also means that I might be adjusting my sewing challenge ideas to go more with where my heart is leading. They're not focusing on the 1940s or later for it, so I might have to just post them on here and not be able to share them in the official group, but that's okay. My goal was to do more sewing this year and that sewing challenge was just a vehicle for that goal. I look forward to my new sewing adventures ahead!! Wonderful! The ensemble is perfect and I love the yawn picture! And I'm really excited to see your emerging 1940s wardrobe!